These are images of the proposed building revitalization projects in the district. 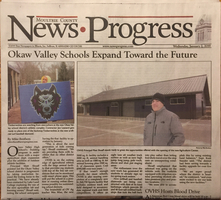 Letter from Superintendent Please see the linked letter above from Okaw Valley Superintendent Kent Stauder in regards to upcoming public meetings to discuss building revitalization in the district. 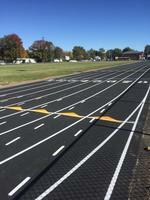 The new track surface is complete and painted now! 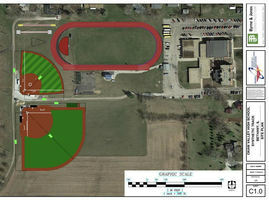 Progress is being made on the athletic facilities upgrades at the high school. Work continues on the baseball field and softball field while the track surfacing is complete and recently got painted as well. It is ready for the spring track season. Go T-Wolves! Work has begun on the new Ag Facility being constructed at OVHS. This building will be the center of the expanded Agriculture program at OV. 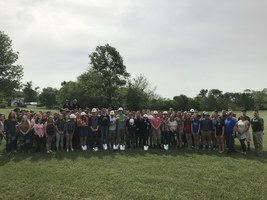 Students will get hands-on experience across the agricultural industry including livestock animals, agronomy, corn, soybeans, cover crops, honeybees, wildlife and more. Construction is expected to progress through October.